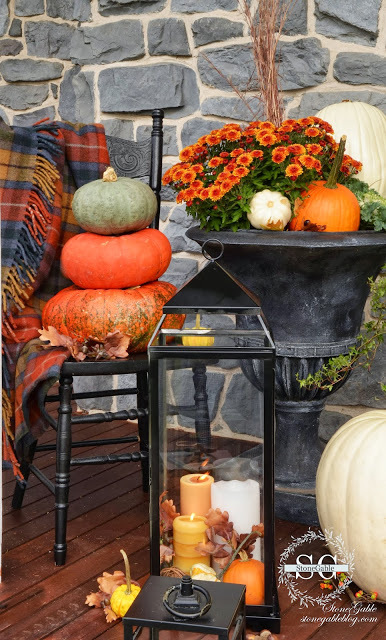 We are honored to bring you 25 bloggers autumn decorating ideas. Today we present porches #21 - 25. We are pretty jazzed by all the fall decor we have seen from these creative bloggers. Our thanks to Yvonne, Sharon, Sheila, Colleen and Pat! 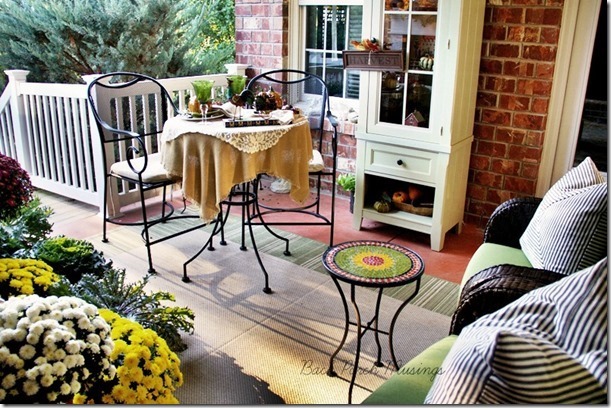 Pat, author of Back Porch Musings, has a back porch that is amazingly beautiful and cozy at the same time. In fact, she said that her back porch is what inspired her to create her blog. We can see why! Is this not a lovely spot? Oh my, yes it is. Pat has this wonderful fireplace and mantle. That in itself make her porch a special kind of retreat. And look how she has it decorated for sweet autumn days. The beautiful rooster, gorgeous mums, kale and autumn leaf garland are stunning. Wouldn't you love to have pumpkin soup with Pat at this bistro table? Now we see her porch from another perspective. That cute bistro table and even a china hutch. And Pat has some super comfortable looking wicker furniture all plush with soft pillows. What an inviting outdoor living space. 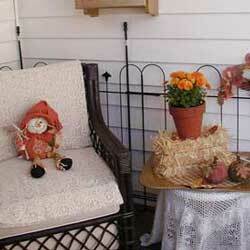 Pat has many more close-up pictures of her sweet autumn back porch on her blog. Please visit Back Porch Musings. Sharon Hines is the author of Mrs. Hines Class, a blog where Sharon gives lessons on making memories, recipes and DIY home projects. 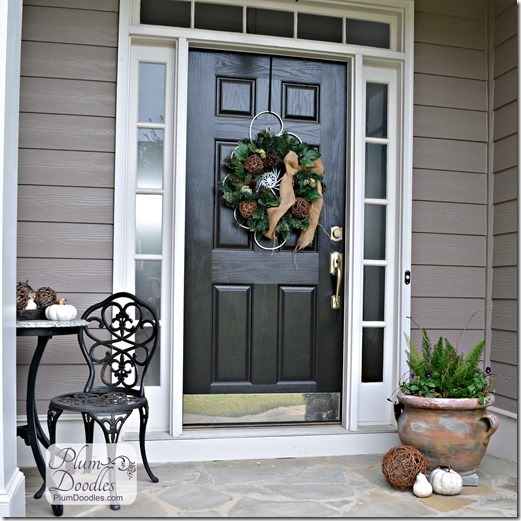 She tells the story of her porch on her blog. How she secretly wished for a larger porch when her house was being built. Sharon's window box is filled with glorious autumn harvest. 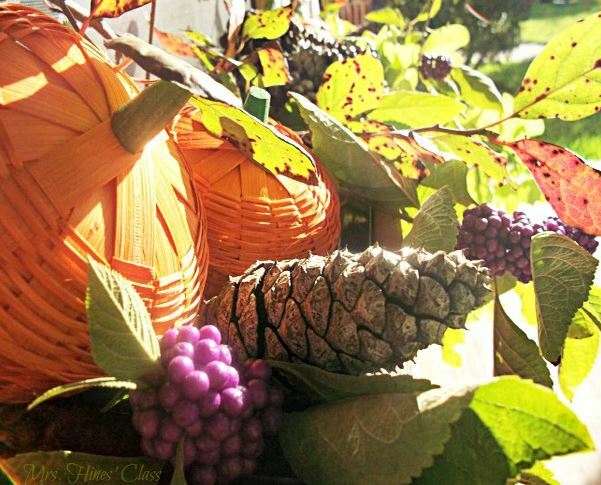 I like the wicker pumpkins, pine cones and colorful grapes she chose. So while Sharon's home was being built, she would drive by hoping for a larger porch. One day the porch went up and Sharon was surprised to find that her porch was just what she wanted. A place where she could have rocking chairs. 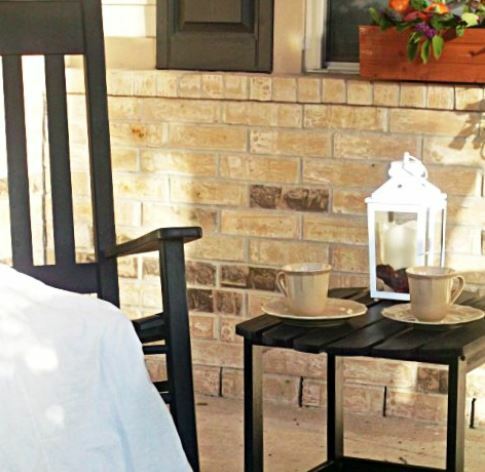 Here you see a peaceful place on Sharon's porch for a cup of morning coffee. And you can catch a glimpse of her window box, too. 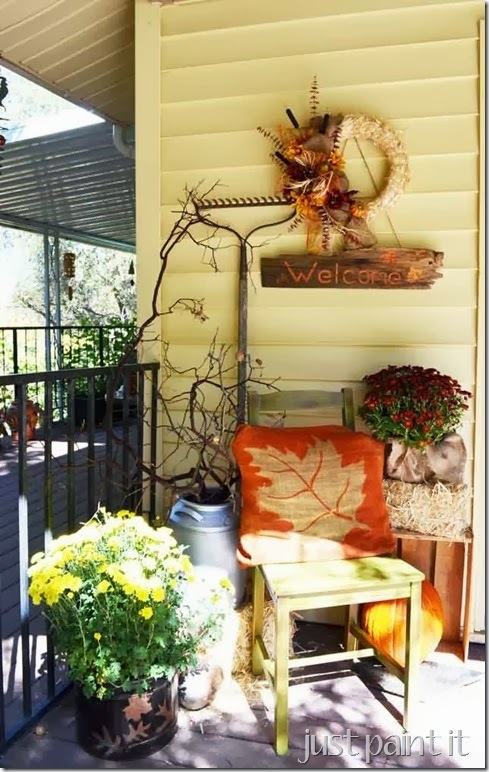 Hop on over to Sharon's blog, Mrs. Hines Class, see see more pictures of her fall porch. 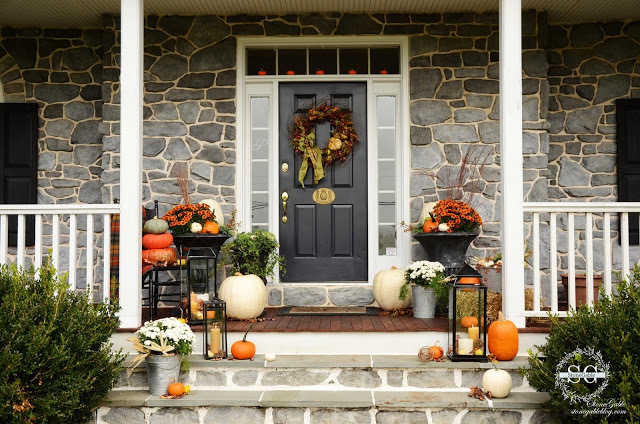 Sheila, author of Plum Doodles, likes to change out her front door decor as the seasons change. Do you see the scroll-like decoration behind the wreath? That's a base that she has used for numerous seasons including spring - where she had hydrangeas and seed packets on her front door. The wreath was from a thrift store. Sheila cleaned it up and added the rattan balls and burlap bow to give it more of an autumn look. Sheilia plans to add some Christmas bulbs to the wreath to transition this door decoration into the holidays. I wonder if she will chose silver. Or maybe red or blue? In order to keep a cohesive look, Sheila added rattan balls to the bistro table, too, to tie in with the wreath. If you click over to her blog, Plum Doodles, you will see how she also added rattan balls and pansies to her asparagus fern. Please stop by. Colleen, author of Just Paint It, does wonders with paint. Her porch is intriguing. Just look closely and see what she has created with a little paint. What a colorful and cozy corner that Colleen created on her porch. First thing that caught my eye is the autumn pillow. I read Colleen's tutorial on how she made this - simply from a piece of burlap and a large felt wreath that she purchased at the dollar store. She placed the leaf on the burlap and spray painted all around it with an orange-ish color spray paint. It's striking! Here's a rickety old rake that Colleen fashioned with a straw wreath. She decorated the wreath with burlap ribbons, assorted natural elements like cattails plus some flowers she got at the dollar store. I would be so happy with that autumn wreath. That's some savvy arranging. 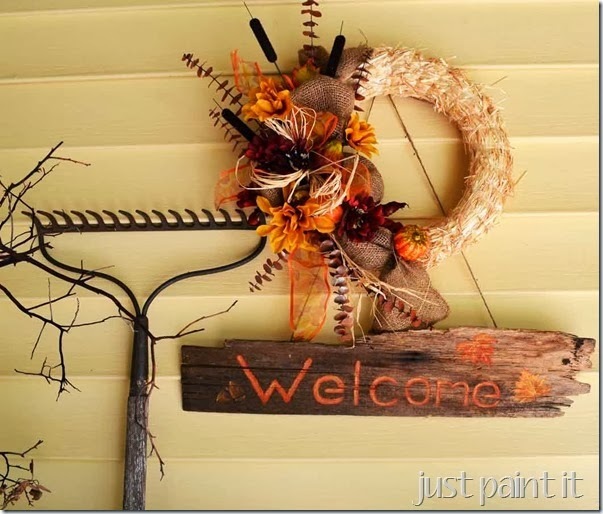 She also turned a weathered piece of old wood into a charming and colorful welcome sign. And looks like some willow branches added for extra appeal. 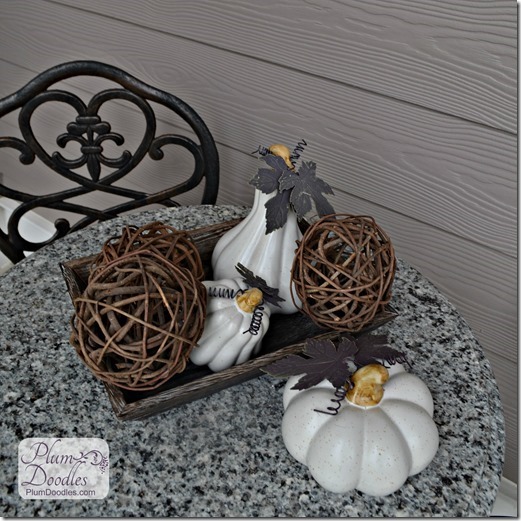 Colleen shares more of her fall porch tour on her blog, Just Paint It. Find out more about her antique chair and salvaged planter. Yvonne, author of Stone Gable, lives in a beautiful stone home with a wonderful front porch. 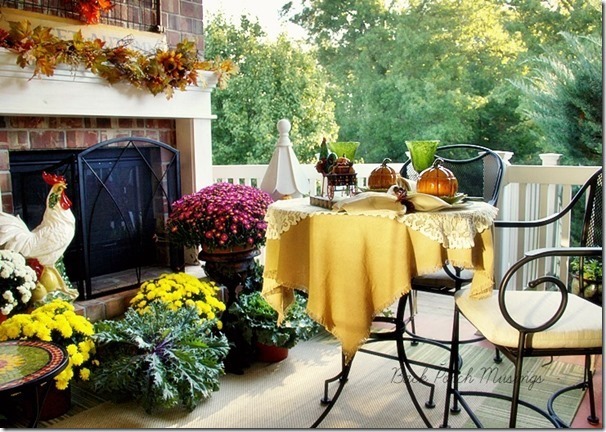 Yvonne's autumn porch is abundantly blessed with color and autumn's harvest. She has a wonderful knack of arranging things in a natural, wispy way. I like how the urns, pumpkins, mums and lanterns repeat the same colors: orange, black and white. And such an interesting mixtures of sizes and textures - just beautiful. Here you see a close-up of how Yvonne stacked pumpkins onto a black chair and draped it with a soft plaid blanket. Love that plaid. Mixing in fresh plants like the fresh mums always works nicely. I also liked how Yvonne created an autumn palette in her lanterns. 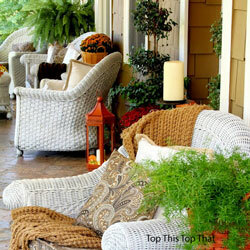 Yvonne shares more many more pictures of her wonderful fall front porch on her blog, Stone Gable. Please give her a visit. What an opportunity to feature the 25 Bloggers fall and Halloween porch tours with you. This is #21 through #25 porches which concludes the series. The links to the other 20 porches are below. Take a moment to browse please!